Great news if you're a Sony Ericsson fan - the company looks set to drop a range of new products tonight at a special launch in London. Sony Ericsson remains tight-lipped on what exactly will be revealed. 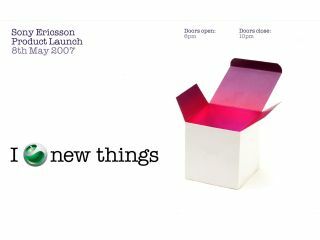 We're hoping for new Walkman and Cybershot handsets - even if the box on the 'I Love New Things' invite we've received does look suspiciously pink. We'll bring you full details as soon as we have them.